Place the stock and miso in a medium deep-sided frying pan over high heat and bring to the boil. Add the chicken, reduce the heat to low and cook, covered, for 12–15 minutes or until cooked through. Remove the chicken from the pan and set aside to cool. Return the stock to high heat and bring to the boil. Add the broccolini and cook for 1–2 minutes or until tender. Drain and refresh under cold water. To make the dressing, place honey, miso, vinegar, oil, soy sauce and water in a bowl and whisk to combine. 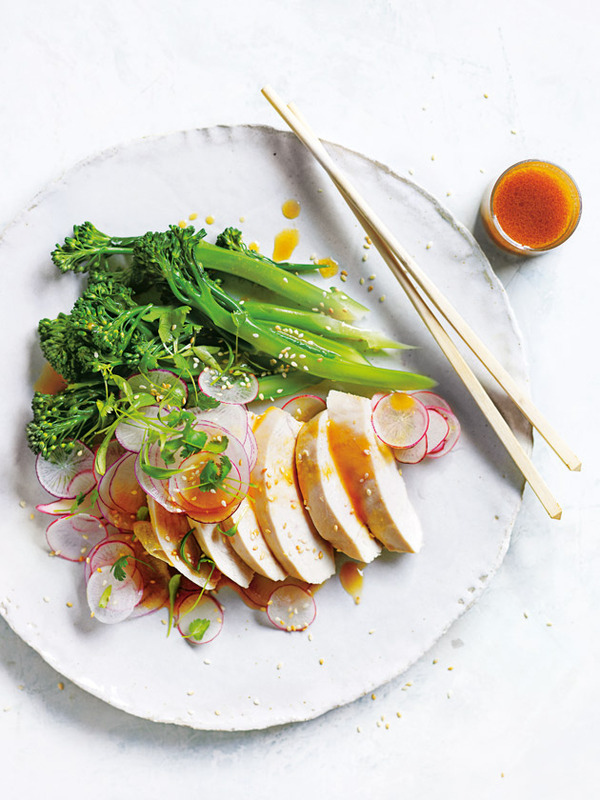 Place the broccolini, radish and half the dressing in a large bowl, toss to combine and divide among bowls. Slice the chicken and place on top of the salad. Top with the remaining dressing, the sesame seeds and coriander. Serves 4.